MY FELLOW CITIZENS – A very large portion of the speech which Judge Douglas has addressed to you has previously been delivered and put in print. [Laughter.] I do not mean that for a hit upon the Judge at all. [Renewed laughter.] If I had not been interrupted, I was going to say that such an answer as I was able to make to a very large portion of it, had already been more than once made and published. There has been an opportunity afforded to the public to see our respective views upon the topics discussed in a large portion of the speech which he has just delivered. I make these remarks for the purpose of excusing myself for not passing over the entire ground that the Judge has traversed. I however desire to take up some of the points that he has attended to, and ask your attention to them, and I shall follow him backwards upon some notes which I have taken, reversing the order by beginning where he concluded. Now a few words in regard to these extracts from speeches of mine, which Judge Douglas has read to you, and which he supposes are in very great contrast in each other. Those speeches have been before the public for a considerable time, and if they have any inconsistency in them, if there is any conflict in them the public have been able to detect it. 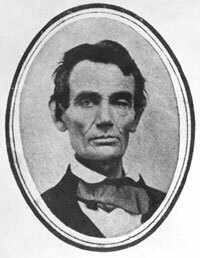 When the Judge says, in speaking on this subject, that I make speeches of one sort for the people of the Northern end of the State, and of a different sort for the Southern people, he assumes that I do not understand that my speeches will he put in print and read North and South. I knew all the while that the speech that I made at Chicago and the one I made at Jonesboro and the one at Charleston, would all be put in print and all the reading and intelligent men in the community would see them and know all about my opinions. And I have not supposed, and do not now suppose, that there is an conflict whatever between them. 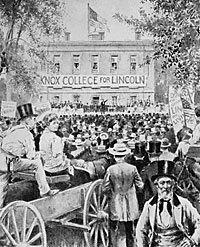 [‘They are all good speeches!’ ‘Hurrah for Lincoln!’] But the Judge will have it that if we do not confess that there is a sort of inequality between the whites and black races, which justifies us in making them slaves, we must, then, insist that there is a degree of equality that requires us to make them our wives. [Loud applause, and Cries, ‘Give it to him;’ ‘Hit him again.’] Now, I have all the while taken a broad distinction in regard to that matter; and that is all there is in these different speeches which he arrays here, and the entire reading of either of the speeches will show that that distinction was made. Perhaps by taking two parts of the same speech, he could have got up as much of a conflict as the one he has found. I have all the while maintained , that in so far as it should be insisted that there was an equality between the white and black races that should produce a perfect social and political equality, it was an impossibility. This you have seen in my printed speeches, and with it I have said, that in their right to ‘life, liberty and the pursuit of happiness,’ as proclaimed in that old Declaration, the inferior races are our equals. [Long-continued cheering.] And these declarations I have constantly made in reference to the abstract moral question, to contemplate and consider when we are legislating about any new country which is not already cursed with the actual presence of evil – slavery. I have never manifested any impatience with the necessities that spring from the actual presence of black people amongst us, and the actual existence of slavery amongst us where it does already exist; but I have insisted that, in legislating for new countries, where it does not exist, there is not just rule other than that of moral and abstract right! With reference to those new countries, those maxims as to the right of a people to ‘life, liberty and the pursuit of happiness, ‘were just rules to be constantly referred to. There is no misunderstanding this, except by men interested to misunderstand it. [Applause.] I take it that I have an intelligent and reading community, who will peruse what I say, weigh it, and then judge whether I advance improper or unsound views, or whether I advance hypocritical, and deceptive, and contrary views in different portions of the country. I believe myself to be guilty of no such thing as the latter, though, of course, I cannot claim that I am entirely free from all error in the opinions I advance. Now, in regard to what Judge Douglas said (in the beginning of his speech) about the Compromise of 1850, containing the principle of the Nebraska bill, although I have not done so in this canvass, I will, if you please, detain you a little with them. I have always maintained, so far as I was able, that there was nothing of the principle of the Nebraska bill in the compromise of 1850 at all – nothing whatever. Where can you find the principle of the Nebraska bill in that compromise? If anywhere, in the two pieces of the compromise organizing the Territories of New Mexico and Utah. It was expressly provided into these two acts, that, when they came to be admitted into the union, they should be admitted with or without slavery during the territorial existence of those territories, while Henry Clay constantly made the declaration, (Judge Douglas recognizing him as a leader) that, in his opinion, the old Mexican laws would control that question during the territorial existence as well as at the time of framing the constitution, the people, if you please, might have slaves if they wanted them? I am not discussing the question whether it is right or wrong; but how are the New Mexican and Utah laws patterns for the Nebraska bill? I maintain that the organization of Utah and New Mexico did not establish a general principle. The acts to which I have referred were a part of a general system of Compromises. They did not lay down what was proposed as a regular policy for the Territories; only an agreement in this particular case to do in that way, because other things were done that were to be a compensation for it. They were allowed to come in that shape, because in another way it was paid for – considering that as apart of that system of measures called the Compromise of 1850, which finally included half a dozen acts. It included the admission of California as a free State, which was kept out of the Union for half a year because it had formed a free Constitution. It included the settlement of the boundary of Texas, which had been undefined before, which was in itself a slavery question; for, if you pushed the line farther west, you made Texas larger, and made more slave territory; while, if you drew the line towards the east, you narrowed the boundary and diminished the domain of slavery, and by so much increased free territory. It included the passage of a new Fugitive Slave Law. All these things were put together, and though passed in separate acts, were nevertheless in legislation, (as the speeches at the time will show,) made to depend upon each other. Each got votes, with the understanding that the other measures were to pass, and by this system of compromise, in that series of measures, those two bills – the New Mexico and Utah bills – were passed; and I saw for that reason they could not be taken as models, framed upon their own intrinsic principle, for all future Territories. And I have the evidence of this in the fact that Judge Douglas, a year afterwards, or more than a year afterwards, perhaps, when he first introduced bills for the purpose of framing new Territories, did not attempt to follow these bills of New Mexico and Utah; and even when he introduced this Nebraska bill, I think you will discover that he did not exactly follow them. But I do not wish to dwell at great length upon this branch of the discussion. My own opinion is, that thorough investigation will show most plainly that the New Mexico and Utah bills were part of a system of compromise, and not designed as patterns for future territorial legislation; and that this Nebraska bill did not follow them as a pattern at all. Judge Douglas has again, for, I believe, the fifth time, if not the seventh, in my presence, reiterated his charge of a conspiracy or combination between the National Democrats and Republicans. What evidence Judge Douglas has upon this subject I know not, I have said upon a former occasion, and I do not choose to suppress it now, that I have no objection to the division in the Judge’s party. [Cheers.] He got it up himself. It was all his and their work. He had, I think, a great deal more to do with the steps that led to the Lecompton Constitution than Mr. Buchanan had [applause]; though at last, when they reached it, they quarrelled over it, and their friends divided upon it. [Applause.] I am very free to confess to Judge Douglas that I have no objection to the division, [loud applause and laughter]; but I defy the Judge to show any evidence that I have in any way promoted that division, unless he insists on being a witness himself in merely saying so. [Laughter.] I can give all fair friends of Judge Douglas here to understand exactly the view that Republicans take in regard to that division. Don’t you remember how two years ago the opponents of the Democratic party were divided between Fremont and Fillmore? I guess you do. [‘Yes, sir, we remember it mighty well.’] Any Democrat who remembers that division, will remember also that he was at the time very glad of it, [laughter,] and then he will be able to see all there is between the National Democrats and the Republicans. What we now think of the two divisions of Democrats, you then thought of the Fremont and Fillmore divisions. [Great cheers.] That is all there is of it. It is true that the set of resolutions read by Judge Douglas were published in the Illinois State Register on the 16th Oct., 1854, as being the resolutions of an Anti-Nebraska Convention, which had sat in that same month of October, at Springfield. But it is also true that the publication in the Register was a forgery then, [cheers], and the question is still behind, which of the three, if not all of them, committed that forgery? [Great applause.] The idea that it was done by mistake, is absurd. The article in the Illinois State Register contains part of the real proceedings of that Springfield Convention, showing that the writer of the article had the real proceedings before him, and purposely threw out the genuine resolutions passed by the Convention, and fraudulently substituted the others. Lanphier then as now, was the editor of the Register, so that there seems to be but little room for his escape. But then it is to be borne in mind that Lanphier has less interest in the object of that forgery than either of the other two. [Cheers.] The main object of that time was to beat Yates and elect Harris to Congress, and that object was known to be exceedingly dear to Judge Douglas at that time. [Laughter.] Harris and Douglas were both in Springfield when the Convention was in session, and although they both left before the fraud appeared in the Register, subsequent events show that they have both had their eyes fixed upon that Convention. The fraud having been apparently successful upon the occasion, both Harris and Douglas have more than once since then been attempting to put it to new uses. As the fisherman’s wife, whose drowned husband was brought home with his body full of eels, said when she was asked, ‘What was to be done with him?’ ‘Take the eels out and set him again.’ [great laughter;] so Harris and Douglas have shown a disposition to take the eeles out of that stale fraud by which they gained Harris’ election, and set the fraud again more than once. [Tremendous cheering and laughter.] 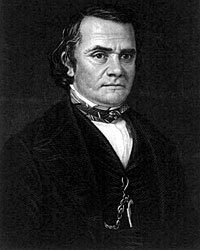 On the 9th of July, 1856, Douglas attempted a repetition of it upon Trumbull on the floor of the Senate of the United States, as will appear from the appendix of the Congressional Globe of that date. Judge Douglas requires an indorsement of his truth and honor by a re-election to the United States Senate, and he makes and reports against me and against Judge Trumbull day after day charges which we know to be utterly untrue, without for a moment seeming to think that this one unexplained fraud, which he promised to investigate, will be the least drawback to his claim to belief. Harris ditto. He asks a re-election to the lower House of Congress without seeming to remember at all that he is involved in this dishonorable fraud! The Illinois State Register, edited by Lanphier, then, as now, the central organ of both Harris and Douglas, continues to din the public ear with this assertion without seeming to suspect that these assertions are at all lacking in title to belief. To this interrogatory Judge Douglas made no answer in any just sense of the word. He contented himself with sneering at the thought that it was possible for the Supreme Court ever to make such a decision. He sneered at me for propounding the interrogatory. I had not propounded it without some reflection, and I wish now to address to this audience some remarks upon it. Nothing in the Constitution or laws of any State can destroy a right distinctly and expressly affirmed in the Constitution of the Untied States. Therefore, nothing in the Constitution or laws of any State can destroy the right of property in a slave. There is, my friends, only one other point to which I will call your attention for the remaining time that I have left me, and perhaps I shall not occupy the entire time that I have, as that one point may not take me clear through it. Among the interrogatories that Judge Douglas propounded to me at Freeport, there was one in about this language: ‘Are you opposed to the acquisition of any further territory to the United States, unless slavery shall first be prohibited therein?’ I answered as I thought, in this way, that I am not generally opposed to the acquisition of additional territory, according as my supporting it was or was not calculated to aggravate this slavery question amongst us. I then proposed to Judge Douglas another interrogatory, which was correlative to that: ‘Are you in favor of acquiring additional territory in disregard of how it may affect upon the slavery question?’ Judge Douglas answered, that is, in his own way he answered it. [Laughter.] I believe that, although he took a good many words to answer it, it was a little more fully answered than any other. The substance of his answer was, that this country would continue to expand – that it would need additional territory – that it was as absurd to suppose that we could continue upon our present territory, enlarging in population as we are, as it would be to hoop a boy twelve years of age, and expect him to grow to man’s size without bursting the hoops. [Laughter.] I believe it was something like that. Consequently he was in favor of the acquisition of further territory, as fast as we might need it, in disregard of how it might affect the slavery question. I do not say this as giving his exact language, but he said so substantially, and he would leave the question of slavery where the territory was acquired, to be settled by the people of the acquired territory. [‘That’s the doctrine.’] May be it is; let us consider that for a while. This will probably, in the run of things, become one of the concrete manifestations of this slavery question. If Judge Douglas’ policy upon this question succeeds, and gets fairly settled down, until all opposition is crushed out, the next thing will be a grab for the territory of poor Mexico, an invasion of the rich lands of South America, then the adjoining islands will follow, each one of which promises additional slave fields. And this question is to be left to the people of those countries for settlement. When we shall get Mexico, I don’t know whether the Judge will be in favor of the Mexican people that we get with it settling that question for themselves and all others; because we know the Judge has a great horror for mongrels, [laughter,] and I understand that the people of Mexico are most decidedly a race of mongrels. [Renewed laughter.] I understand that there is not more than one person there out of eight who is pure white, and I suppose from the Judge’s previous declaration that when we get Mexico or any considerable portion of it, that he will be in favor of these mongrels settling the question, which would bring him somewhat into collision with his horror of an inferior race. It is be remembered, though, that this power of acquiring additional territory is a power confided to the President and Senate of the United States. It is a power not under the control of the Representatives of the people any further than they, the President and the Senate can be considered the representatives of the people. Let me illustrate that by a case we have in our history. When we acquired the territory from Mexico in the Mexican war, the House of Representatives, composed of the immediate representatives of the people all the time insisted that the territory thus to be acquired should be brought in upon condition that slavery should be forever prohibited therein, upon the terms and in the language that slavery had been prohibited from coming into this country. That was insisted upon constantly, and never failed to call forth an assurance that any territory thus acquired should have that prohibition in it, so far as the House of Representatives was concerned. But at last the President and Senate acquired the territory without asking the House of Representatives anything about it, and took it without that prohibition. They have the power of acquiring territory without the immediate representatives of the people being called upon to say anything about it, and thus furnishing a very apt and powerful means of bringing new territory into the Union, and when it is once brought into the country, involving us anew in this slavery agitation. It is, therefore, as I think, a very important question for the consideration of the American people, whether the policy of bringing in additional territory, without considering at all how it will operate upon the safety of the Union in reference to this one great disturbing element in our national politics, shall be adopted as the policy of the country. You will bear in mind that it is to be acquired, according to the Judge’s view, as fast as it is needed, and the indefinite part of this proposition is that we have only Judge Douglas and his class of men to decide how fast it is needed. We have no clear and certain way of determining or demonstrating how fast territory is needed by the necessities of the country. Whoever wants to go out filibustering, then, thinks that more territory is needed. Whoever wants wider slave fields, feels sure that some additional territory is needed as slave territory. Then it is as easy to show the necessity of additional slave territory as it is to assert anything that is incapable of absolute demonstration. Whatever motive a man or a set of men may have for making annexation of property or territory, it is very easy to assert, but much less easy to disprove, that is necessary for the wants of the country. And now it only remains for me to say that I think it is a very grave question for the people of this Union to consider whether, in view of the fact that this Slavery question has been the only one that has ever endangered our republican institutions – the only one that has ever threatened or menaced a dissolution of the Union – that has ever disturbed us in such a way as to make us fear for the perpetuity of our liberty – in view of these facts, I think it is an exceedingly interesting and important question for this people to consider, whether we shall engage in the policy of acquiring additional territory, discarding altogether from our consideration, while obtaining new territory, the question how it may affect us in regard to this the only endangering element to our liberties and national greatness. The Judge’s view has been expressed. I, in my answer to his question, have expressed mine. I think it will become an important and practical question. Our views are before the public. I am willing and anxious that they should consider them fully-that they should turn it about and consider the importance of the question, and arrive at a just conclusion as to whether it is or is not wise in the people of this Union, in the acquisition of new territory, to consider whether it will add to the disturbance that is existing amongst us – whether it will add to the one only danger that has ever threatened the perpetuity of the Union or our own liberties. I think it is extremely important they shall decide, and rightly decide that question before entering upon that policy. An now, my friends, having said the little I wish to say upon this head, whether I have occupied the whole of the remnant of my time or not, I believe I could not enter upon any new topic so as to treat it fully without transcending my time, which I would not for a moment think of doing. I give way to Judge Douglas. Carl Sandburg, Abraham Lincoln: The Prairie Years and the War Years, p. 140. Herbert Mitgang, editor, Lincoln as They Saw Him, p. 123 (Jason Sherman, Galesburg Free Democrat, October 8, 1858). Herbert Mitgang, editor, Lincoln as They Saw Him, p. 125 (Jason Sherman, Galesburg Free Democrat, October 8, 1858). David Zarefsky, Lincoln Douglas and Slavery: In the Crucible of Public Debate, p. 62. William Lee Miller, Lincoln’s Virtues: An Ethical Biography, . William E. Barton, The Life of Abraham Lincoln, Volume I, p. 396. Benjamin Thomas, Abraham Lincoln, p. 190. Roy P. Basler, editor, The Collected Works of Abraham Lincoln, Volume III, p. 219-237 (Galesburg, October 7, 1858).